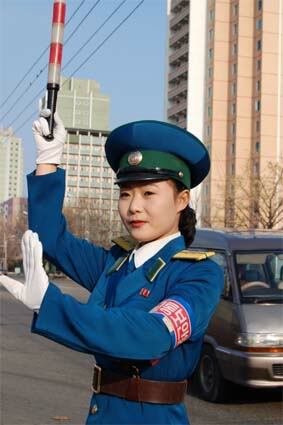 I found this article from the North Korean site Korea Today featuring some Traffic Ladies. On streets are seen traffic security girls maintaining the traffic order day and night in all seasons, but it was difficult to know their life in detail. This curiosity made me turn my attention to the crossroads post by the People’s Palace of Culture in Central District, Pyongyang. Kwak Yun Gyong is the head of the post. I should train all members into competent ones who can quickly judge and handle things under any circumstances. This is her goal. Everyday she gives tasks of training, judges their capabilities, makes them correct their mistakes, and teaches them how to deal with complex developments. She is such a strict commander, and yet a warm-hearted eldest sister. She has spent countless holidays and nights in cold winter with the young members of the post on duty, and walked numerous miles for those in illness. As she cares for members while having less rest and sleep, she is called “our eldest sister” at the post. The “dancer” is O Ryon Ok whose stop-go signs control numerous vehicles endlessly passing the crossroads. There can be seen nods exchanged between her and drivers. She skillfully handles the complicated circumstances with her quick and rhythmic movements that resemble dancing. The “dancer” at the crossroads seems to have a special language to communicate with drivers. One can understand the worry of a driver whose car breaks down on the road. But nobody needs to worry about such a matter at this crossroads, for the post has necessary parts and tools in a box. Drivers call the box “treasure box”, and An Jong Im pays special attention to the box. As it is a rule for her to check the security of the road, looking round dangerous spots everyday, so she has made it another rule to replenish the “treasure box”. To live as a servant of the people—this is her invariable idea. The joker is Pyon Yong Suk (21) whose absence even for a moment gives rise to a “stir” at the post. Her jokes often move her colleagues to laughter. She is not by nature humorous. But she made up her mind to give pleasure to her colleagues who had hardly laughed, tired from service, though at the age in which they smile even at fallen leaves being carried by the wind. So she began to make jokes. Now it’s become her habit. Pyon, once a member of the basketball circle in her school days, still plays the role as the basketball captain of the “post team”. Hong Yong Mi is the youngest of the post. Though she is the eldest child at home, she is treated as the youngest at the post. This often “displeases” her. All good things are given to her. Though everybody is equally provided with the “Pomhyanggi” cosmetics and medicated cream, her “elder sisters” give her another share. When a ticket to a cinema or a theatre is obtained, it is given to her while other colleagues readily substitute for her on duty. When will I be able to concede my “position as the youngest”? she frequently thinks. I want to see An Jong Im's treasure box. Does this mean that some Traffic Girls are also trained as on-the-spot mechanics? I can't quite figure out this sentence - "But she made up her mind to give pleasure to her colleagues who had hardly laughed, tired from service, though at the age in which they smile even at fallen leaves being carried by the wind. " It shows that the NK translators to English are underschooled, or are trying too hard to write poetic. It means the senior trafficgirls hardly laugh because they are tired of working, even though most young women their age smile often. Yes I know - it's the leaves and wind reference that I found strange. I believe the "fallen leaves" reference means the new PTGs are young and impressionable. They also are happy and smile at the slightest event, such as a leave falling from a tree. The Commander or "Eldest Sister" was making the point that the young PTGs were so tired after a long day of work they could not even smile, so she needs keep their morale up and tries cheering them up. As always in translation something is lost. The "fallen leaves" expression is probbaly an idiom which does not translate well. One need understand the language and culture well to make any sense of expressions like that. Anyway this is my guess at the meaning of the PTG Commander's statement; as I don't speak Korean anyone's guess is as good as mine. Looking at the website, the articles are obviously written in English by North Koreans, so it might not be a translation issue, but the idiom point is probably correct. I am always surprised when I hear a North Korean translator speaking almost flawless English - how can they have English language immersion programs in NK?